Mr. Kim (age 50, Suwonite) invites five of his neighbors come and play poker. 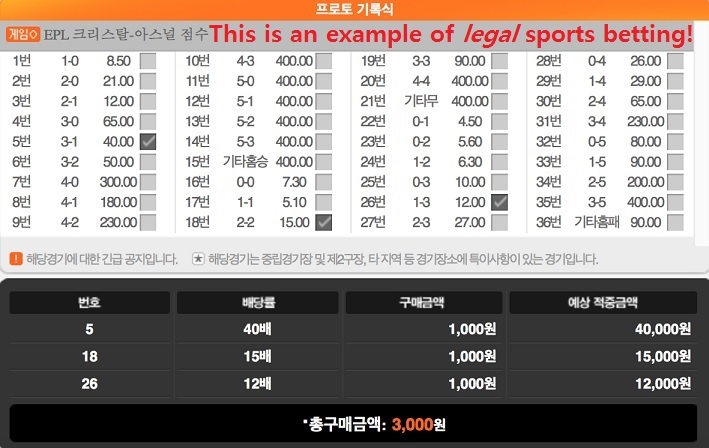 Money/betting is involved, but only KRW 500 – 3000 (USD 0.4 – 2.5) per round. They play for about 40 minutes. Mr. Kim loses the most money, around KRW 32,000 (USD 26.5). Mr. Lee, the winner, pays for everyone’s lunch that day. They part ways after that. Q: Crime or no? In a very similar case last year, the Suwon District Court found them all not guilty of gambling. But not just because of the (small) amount of money. The gambling that day was considered “mere pastime” for these reasons too: 1) They all knew one another, 2) They played for a relatively short period of time + during the day, 3) The winner’s money was spent to buy everyone’s lunch that day, and 4) None of them were very poor. #1 and #4 are especially important. There have been cases where people were found guilty of gambling even when less money (than the above example) was involved. In these cases, people usually were total strangers and/or living on welfare. In other words, “mere pastime” is a relative concept: Was winning money a means (to fun) or an end itself? Last month, one of the three pitchers, Lim Chang-yong, was found guilty and fined 10 mil won. (Side note: Another pitcher, Oh Seung-hwan, who was playing for a team in Japan was together found guilty and received the same punishment.) Both have been banned for half a season by the KBO (Korea Baseball Organization). Lim is now looking for a team, while Oh has since signed with the St. Louis Cardinals in the U.S. As for the other two Lions pitchers, they are still under investigation. Reports say they are training with the team in preparation for the upcoming season. KBO Tidbit: If you are a (recent) fan of Korean professional baseball, I recommend you check out Game 7 of the 1999 playoff series between the Samsung Lions and the Lotte Giants. It’s arguably the most memorable game ever. “Tonight, we win no matter what,” ordered Park Jung-tae to his teammates during the game. He was the Lotte Giants team captain. For me, the most memorable games (in all sports) take place when neither side can imagine losing. And play like there’s no tomorrow. Not all form of “overseas gambling” is a crime (for Koreans). For instance, playing slots for fun while vacationing in Nevada is okay. There are casinos here in Korea too, but almost all are exclusively for non-Koreans. There is only one for both Koreans and non-Koreans: The Gangwon Land Casino. In there, the Criminal Act is preempted by another law, so even Koreans are able to participate. 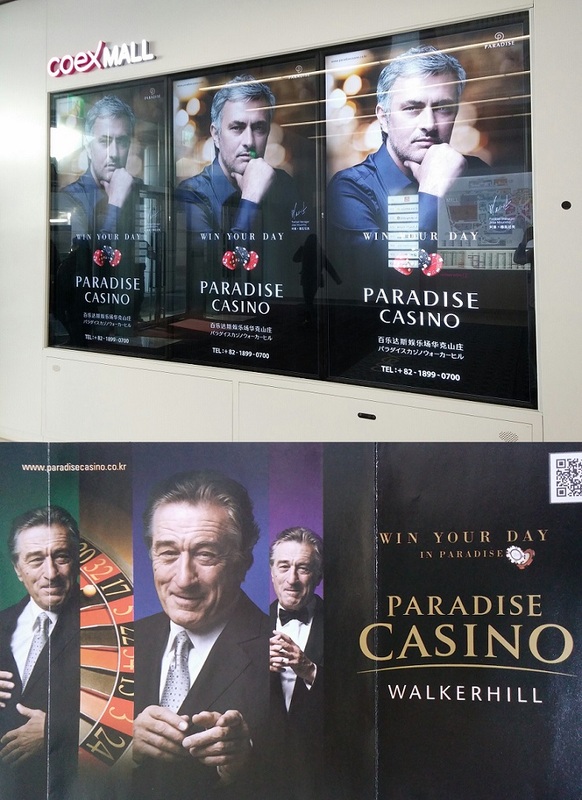 FYI, the Paradise Walkerhill Casino (Seoul) is for non-Koreans only. (The one in Incheon closed down recently. It was the first ever casino in Korea!) 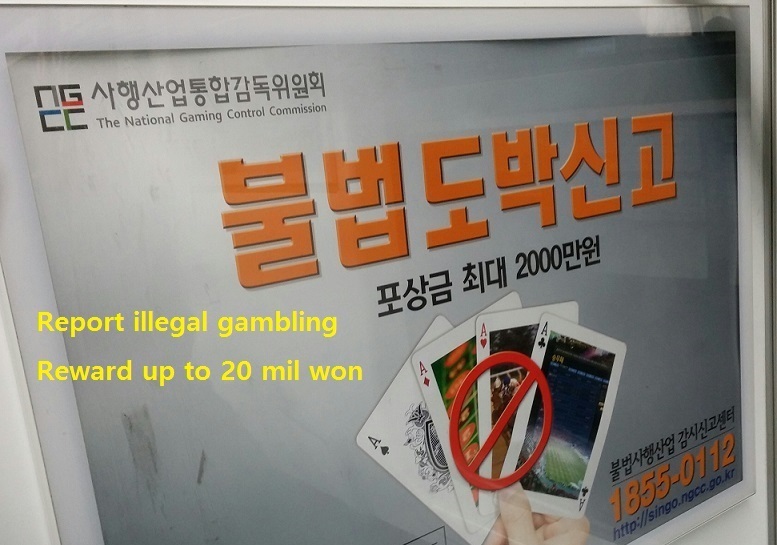 To be clear, gambling (not for “mere pastime”) outside a casino is a crime even for non-Koreans within Korea. So please gamble in its place. Or not at all. 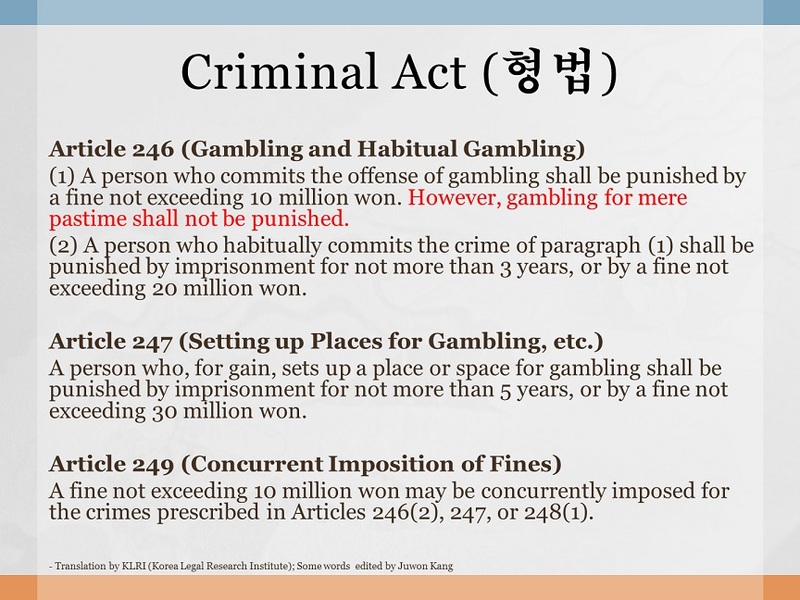 Illegal/private sports betting in Korea is punished under a separate law which outlines harsher criminal punishment. The name of the law is the National Sports Promotion Act (국민체육진흥법). 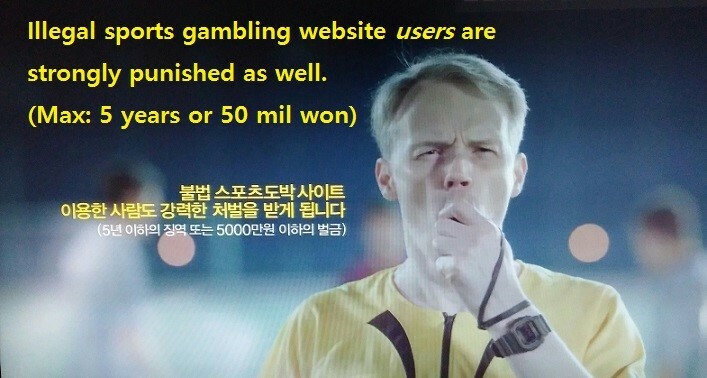 To read a nice post (in Korean) about the consequences of illegal sports betting, click here. DID YOU KNOW? Simply selling coffee where you know illegal gambling to take place constitutes the crime of aiding and abetting. For fun, below is a spam message I received recently. I get these from time to time. 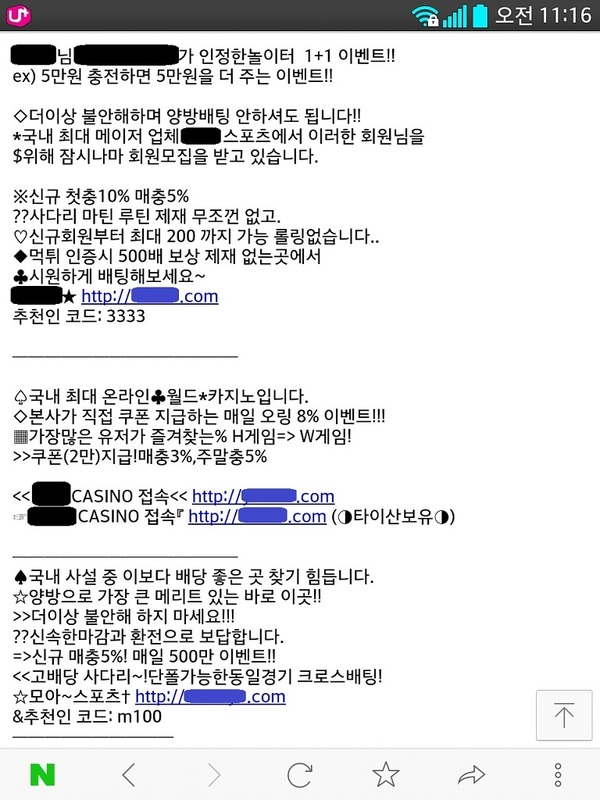 They say such gambling-type messages are the most frequently received spam messages in Korea. 2nd is regarding loans.